Head of the NA Committee for External Relations Nguyen Van Giau talked the outcomes of NA Chairwoman Nguyen Thi Kim Ngan’s recent working visits to Morocco, France, and the European Parliament. Within the framework of her visits and working sessions, the NA Chairwoman had high-level talks and meetings with parliamentary leaders and the governments of Morocco and France, Giau told reporters accompanying the Vietnamese delegation on April 9. In meetings and working sessions in Morocco, the Vietnamese top legislator, and the government and parliament leaders of Morocco expressed their determination to further strengthen multifaceted cooperation, especially in trade, investment, industry, tourism, education, and people-to-people exchange. Leaders of the two countries’ parliaments agreed that their legislative bodies should maintain NA leaders’ visits to the other country every two years, during which experience sharing workshops on specific topics will be held. During the visit, representatives of several ministries, sectors, and localities of the two countries signed cooperation agreements. In France, NA Chairwoman Ngan and French leaders agreed to further promote the bilateral and parliamentary cooperation, Giau said. The French side voiced its support for the early signing and ratification of the European Union-Vietnam Free Trade Agreement (EVFTA) and for Vietnam’s views on solving regional and global issues in the principle of peace, dialogue, and respect for international law. In Belgium, the Vietnamese top legislator had open discussions with leaders of the European Parliament (EP), the European Council (EC), and Belgium on issues related to the EVFTA and the Investment Protection Agreement (IPA) between Vietnam and the EU. The EP, EC, and Belgian leaders affirmed that they will do their best to promote the signing and ratification of the two agreements. Both sides affirmed that they are willing to talk frankly about different views so as to reach a common perception, towards fostering cooperation between Vietnam and the EU in the coming time, Giau said. 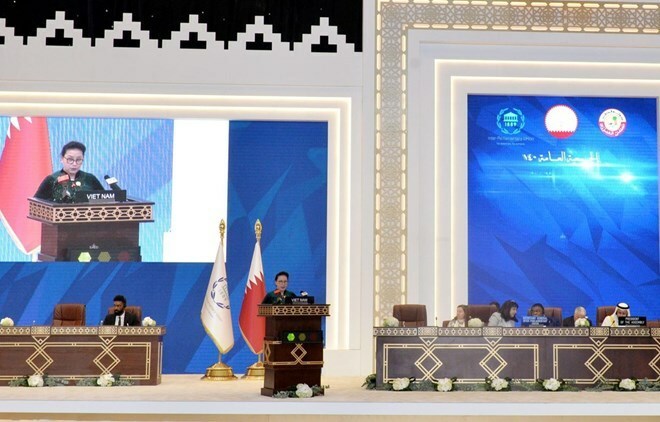 Regarding the NA Chairwoman’s participation in the 140th IPU Assembly in Doha, Qatar, Giau said that in her speech at the event, Ngan spoke highly of the role played by the IPU. She made recommendations on promoting and maintaining peace for development and perfecting legal framework in parliaments and building states of the rule of law, Giau noted, adding that the Vietnamese legislator also suggested that the IPU press ahead with reforms to raise the efficiency and role of its member parliaments in carrying out adopted resolutions.